Police investigating offensive graffiti at Mauthausen concentration camp, where 90,000 people perished during WW2. 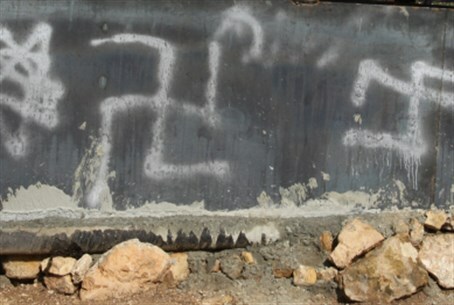 Austrian police said Monday they have launched an investigation after vandals drew and etched four swastikas onto walls inside two buildings at the former Nazi concentration camp Mauthausen. The culprits also scrawled "Hitler" in letters about one centimeter (half an inch) high in felt-tip pen, police said in a statement. The graffiti was noticed by visitors to the camp, now a museum and memorial. "When this vandalism took place is unclear. Most likely it was carried out by visitors," police said. Around 90,000 didn't make it, perishing in back-breaking labor in granite quarries from malnourishment, disease - or shot by the guards, hanged, throttled, beaten to a pulp or gassed.